In case you missed it, 2014 was another banner year for Bernick’s community outreach efforts. Providing better service to our community, Bernick's sponsored and/or supported a wide range of community programs designed to help those in need or simply better the community. These community partnerships were extremely successful and this year's success will be a road map for similar programs for years to come. If you haven't participated in any of the community partnership events of Bernick's this year, take a look at the programs that were run and consider committing to participation in 2015. In partnership with St. Cloud Area Family YMCA, Bernick's sponsored a program designed to encourage healthy eating and exercise for every member of the family. Bernick's hosted several events throughout 2014 including Family Snow Games, Ride and Roll, Family Track & Field Day and Wishbone Walk / Run. These events had a low fee of $10 for an entire family and the fee was freely waived for anyone that couldn't afford it. These events helped hundreds of families get healthier in 2014 and will continue to help in 2015. Bernick's participated in two different food drives in 2014. Teaming up with St. Cloud Metro Bus, Bernick's raised over $1,500 for local food shelters and collected an additional 2,500 pounds of food. The CashWise food drive had similar results. This food and money helped hundreds of local residents enjoy good, healthy meals during the holiday season. Feeding people who are hungry is important and these are they types of community partnerships that Bernick's intends to participate in long into the future. Toys for Tots is an annual holiday season charity drive designed to bring joy to the lives of children who are less privileged. This program donates toys and games to parents of children that can't afford to buy such items for their children, so that all kids can experience the joy of a new, wrapped gift during the holiday season. If you've never participated in Toys for Tots before, it is a great way to add a little joy to a child's life and your own, with just a small donation. Though the holiday season has passed, you can participate next year by contacting Bernick's and offering a new toy or game to the toy drive. Hopefully next year will be as successful as this year was! 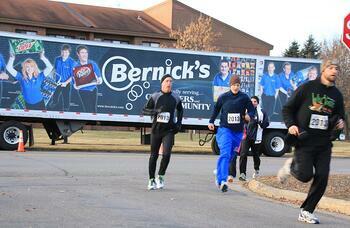 Bernick’s supports Chambers of Commerce in multiple communities. Working hand in hand by volunteering on multiple committees and the Chamber Board, supporting the Unite for Success scholarship program, and sponsoring key events like the Chamber Business Awards and St Cloud Area Day at the Capital. Chambers of Commerce are strong community building organizations and Bernick’s is proud to support them. Bernick's is committed to giving back to the community. Bernick's provides grants to worthwhile organizations throughout our service area. In 2014, Bernick's awarded over $150,000 to fund community programs and services, including Boys & Girls Club of Morrison County, Duluth Area YMCA, Dakota Wicohan, St Cloud Hospital, Pillager Public Schools, and the Science Museum of Minnesota. 2015 grant recipients will be announced in February. In July 2014, Bernick's hosted and sponsored the 38th annual Lawn Social of the Central Minnesota Council Boy Scouts of America. This family friendly event helped build a stronger sense of community for boy scouts and their families in the Central MN area. The large turnout didn't just provide an opportunity for socializing and community growth, but also helped fund the local Scoutreach program. As part of Bernick's commitment to healthy living and exercise, especially in children, Bernick's purchased over 50 Gatorade Sideline Kits and donated them to local high school sports programs. These kits provide necessary fluids for children engaging in high school sports to protect them from dehydration and keep them energized throughout games and practices. These kits were a simple way to encourage physical activities, but also quite effective. We’re honored to be an active part of our community, and take pride in being able to support schools, organizations, and individuals in Central MN. Here’s to making 2015 another great year!